Towel rails help keep your bathroom neat and tidy giving you somewhere to hang your towels and allowing them to dry naturally. Whether you're looking for contemporary rails or a traditional towel rail we have a huge selection for you to choose from. 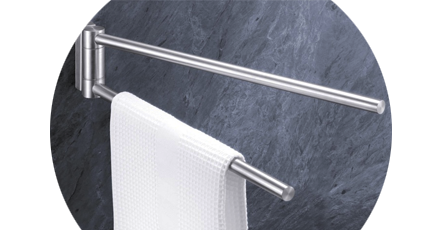 Browse plenty of towel rail styles including freestanding, wall mounted and attachment rails for radiators in a wide range of colours and finishes; chrome, stainless steel, gold, brass, nickel and white to perfectly complement your unique style. Our massive buying power enables us to not only stock a huge selection of towel rails, but we can also offer the best prices too. With prices starting from less than £10 you can have a designer towel rail with any budget.